a book review by Rita Lorraine Hubbard: Cheer Up, Mouse! 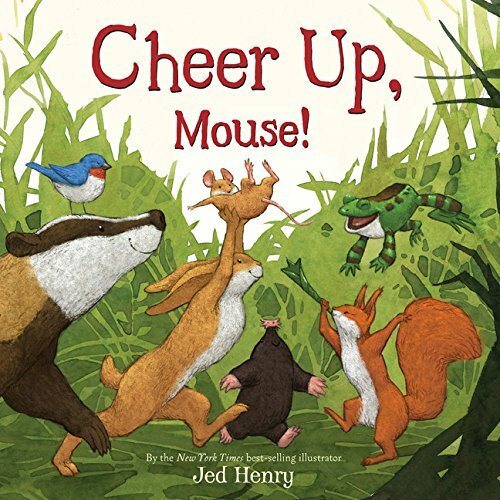 Young children often have a hard time expressing their emotions, so finding a book like Cheer Up, Mouse by author/illustrator Jed Henry might be just what the doctor ordered. In Cheer Up, Mouse, cuddly little Mouse is wearing a sad face. His forest friends—Frog, Badger, Hedgehog, and Crow, to name a few—have no clue why he’s sad and do all sorts of things to make him smile. Crow scoops him up and takes him dipping and diving through the forest, but this does not cheer him up. Frog drags him into the pond to splash and paddle, but this only makes Mouse wet. Other furry friends take turns trying to coax a smile, including Rabbit, who tries to bounce his blues away; Songbirds belting out a cheerful tune; and Mole, who takes Mouse on a tunneling adventure. Nothing works until a thoughtful little chipmunk opens his arms and gives Mouse a soft squeeze. Surprise! It works, because sometimes all a person (or a furry mouse) needs is just a hug. Cheer Up, Mouse! is adorable. The text is brief, to the point, and spot-on for toddlers and preschoolers. Mr. Henry also uses lush detail and deep, rich colors to make Mouse and his sweet, well-meaning animal friends practically hop off the pages. Aside from being a great read for laptime, this book might also be used for helping young children understand what to do about the blahs and the blues. Destined to be an evergreen favorite.